Alula security cameras include doorbell, PTZ and bullet options, with both local and cloud storage and RMR potential for integrators. Alula's Connect+ Platform now includes a line of four surveillance cameras. 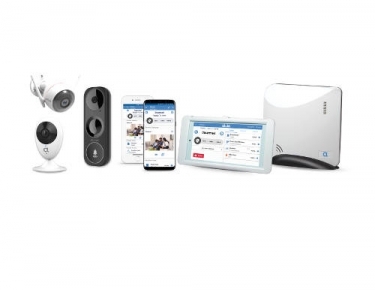 Smart home automation manufacturer Alula has added a fully integrated video surveillance solution to its Alula Connect+ Platform. The line of four low-cost Alula-branded security cameras also has baked-in recurring monthly revenue (RMR) cloud storage fees for integrators with potential margin. Alula Video can be branded by the professional security dealer in the Alula apps for iOS, Android. The video service platform can be offered in conjunction with Connect+, or as an extension to the BAT LTE communicator line from Alula. “Alula continues to deliver on our promise of being an end-to-end platform provider from our encrypted sensors to in-home hub to IP-first, highly secure network,” says Alula CEO Brian McLaughlin. Integrators can select their own pricing for hardware and service, but Alula Video is targeting an MSRP for a single camera system starting at $119 with storage services starting at $5.99/month end-user cost. The service pricing will vary depending on the number of cameras and the desired clip volume that’s included. The product and service pricing model offers dealers markup and leeway to set their own MSRP at competitive rates. “We are providing a vertically integrated end-to-end platform. It just works." Alula Video and Alula App on the Alula Connect+ Platform give dealers integration between security, automation, and video in a single interface that provides control of smart home devices, live and recorded video, and the security system. McLaughlin says the biggest benefits of the integrated security/home automation package are reliability, a seamless end-user experience via the interface, and a full support model from Alula. “There is no fingerpointing at other products if there is a problem. We own it and will take care of it,” he adds. Integrators will still be able to utilize other manufacturers’ cameras with the system if they desire, which might come in handy when a particular niche surveillance application is needed, such as motion analytics or night vision. The image capture is a hybrid system. Every camera includes an SD card for local storage. As the card fills, images are then transferred to the cloud. The cloud storage is a three-tiered system. It can store Standard clips based on movement, which will overwrite the oldest clip over time. Clips based on security events, such as motion detection or a door opening, can be stored in an extended manner. Certain clips can also be flagged as “favorites” and store indefinitely. The Alula storage fees are based on both a per-camera fee as well as the number of “favorites” stored.